When the time comes to purchase trees for your home landscape, you may hear landscape professionals refer to a tree's caliper. Rather than relying on a measure of a tree's height or the width of its leafy canopy, caliper refers to the diameter of a tree's trunk. Nurseries and landscapers utilize standard caliper measurements when comparing and selling trees. This assures homeowners make valid comparisons when purchasing new trees for their homes. Close up of man measuring tree trunk. Generally speaking, the larger a tree's caliper, the larger the plant. Based on typical characteristics for any tree species, knowing the caliper provides a reference that suggests the tree's size and shape without actually seeing a photo or viewing the tree in person. As a general rule, a 1-inch caliper tree in a nursery or garden center suggests a tree that is about 8 feet tall, while a 3-inch caliper measurement can mean a tree near 14 feet tall. However, this varies according to the type of tree involved. Arborists in a landscape measure tree caliper at chest height to compare mature, established trees. This measurement is generally made 4 1/2 to 5 feet above the soil. In the nursery trade, caliper measurements are not arbitrary. National standards exist for exactly where a tree must be measured. Caliper measurements on young trees are taken 6 inches above the soil. 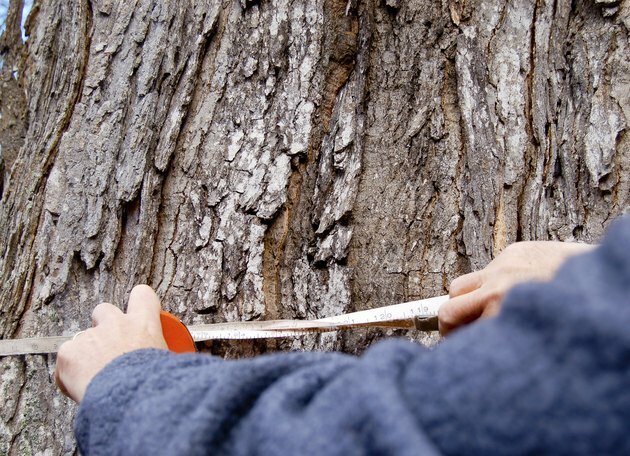 Once a tree's caliper exceeds 4 inches, the tree is measured at a height of 12 inches. All legitimate nurseries and garden centers in the United States use these specific standards to measure tree caliper. A tree trunk's caliper is measured with a device that goes by the same name. The caliper is a utensil that looks like the letter "F", with measuring increments on the long arm of the tool. The caliper tool opens wide and is placed up to the tree trunk. Then the cross arm slides across the long arm until it rests snugly against the bark, quickly revealing the trunk's diameter. This trunk diameter correlates to the measurement number on the long arm of the device. Calipers come in many sizes and styles, but all measure the same way. Issues of tree transportation as well as tree planting are components for pricing landscaping projects. Since larger-caliper trees are typically larger in height, have larger root systems, and weigh more than small-caliper trees, knowing caliper helps determine what equipment or manpower is needed to lift, move or plant various trees. Moreover, since more time and resources are invested to grow large-caliper trees and more energy is needed to move and plant them, they are more expensive than trees with smaller calipers. Different tree species grow at different rates and mature to different heights and widths. Considerable differences exist between tree species in the overall height and canopy spread for trees with similar caliper measurements. For example, a slow-growing tree species may take 15 years to reach a 3-inch caliper, and have an overall height of 10 feet and a 6-foot spread. By contrast, a fast-growing species may have a 3-inch caliper after only five years. A nursery professional can provide insight into key differences between tree species regarding caliper, age and size to ensure you get the right tree for your landscape. How Long Does it Take a Pecan Tree to Mature?